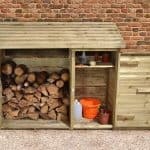 Sheds featuring log stores are becoming increasingly popular, and it’s easy to see why. Log burning stoves are a traditional solution to a modern problem, providing low cost energy that’s also environmentally friendly, but once you have the logs delivered or stored, how do you transport them to where they need to be? That’s where the Log Gobbler from Store-Plus comes in handy, and we feel that it’s a neat item that’s remarkably good value. It folds down to a compact and easily carryable size, yet unrolls to a surprisingly large carrying aid. Made of Jute it’s as environmentally friendly itself, and the two red handles are tough enough to support the load of a plentiful supply of logs without digging into your hands. If you’ve experienced difficulties in transporting logs from your store into your property or into a van in the past, and let’s face it that’s something that most people who use logs have met from time to time, then this is a low cost and very effective solution. You’ll save time and money, and you can also save aches and strains that come from twisting and turning while carrying heavy or bulky items. The Log Gobbler is an open ended canvas carrier, that’s large and yet folds up into a neat and easy to carry size. 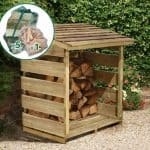 That means that you can simply carry it in your hand to where your supply of logs is kept, for example at the log store next to your garden shed, and then unfold it onto a flat surface. All you have to do then is roll the logs onto the centre of the flat canvas, gather the two red straps and gently lift. 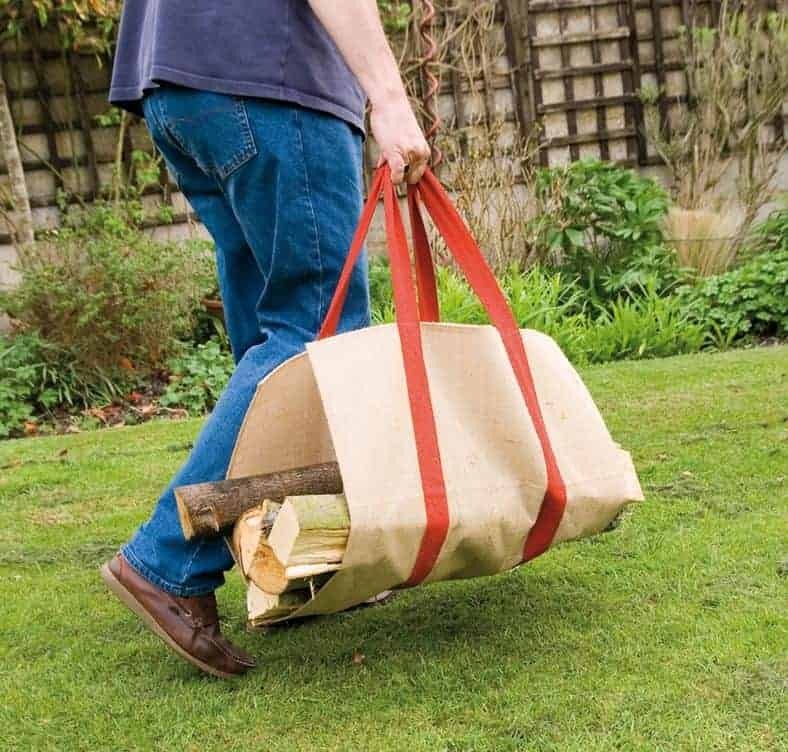 By pulling the sides of the canvas bag around the logs themselves, they are held securely in place until you reach your destination. Once unfolded this log carrier has a size of 103 X 58cm, which means that it can carry more logs than you might think. In fact, we were surprised at just how many logs the carrier could hold, and how securely held they were when lifted and carried. 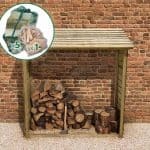 In our opinion, it would be easy to use it to carry at least ten standard sized logs as used on a log fire or log burning stove. When not in use it can be folded up and carried away in your hands or even in a coat pocket. The log gobbler brings three main benefits. 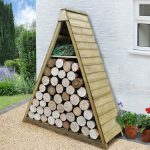 Firstly, it means that you can carry a lot more logs than you would be able to using your bare hands, and they are much more securely held as well so you won’t have to worry about them sliding away whilst you’re walking. Secondly, it’s very cheap when compared to purchasing a wheelbarrow, and it’s quicker and easier to load up too. Thirdly, it brings health and safety benefits. We found it much easier to roll logs into the centre of the carrier before lifting it up, rather than having to lift logs physically up from the floor one by one. By reducing the amount of bending and lifting, it can be ideal for those who suffer from bad backs. The carrier is made of Jute, which is a natural and environmentally friendly material. It has the traditional brown appearance associated with this material, and is supported by two tough red handles which are sewn on to the canvas itself. This is functional rather than attractive, and yet we know that some people might have liked to see a choice of colours available for the handles. For such a great value object, we found the quality to be surprisingly good, as exemplified by the relatively smooth feel of the jute canvas. Even with a full load of logs carried in it, the canvas shows no sign of being under strain, and the handles are very firmly attached. We’d be confident of this carrier lasting for many years, even with regular use. This is a very simple design, but a very effective one as well. Unrolling to a width of more than a metre, it can take a lot of logs and greatly reduce the time spent transporting your timber. We think that the price of less than £10 for such a durable canvas carrier represents good value for money, particularly when compared to other options such as wheelbarrows. 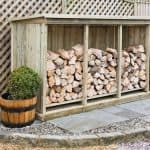 Final Thoughts: If you have a log store, or log burner, then you’re sure to have experienced problems from time to time when carrying your logs. It can be a messy and inexact process, with logs falling from your grip on the way, or being desperately pressed against your chest en route. When you reach the door you then have the problem of trying to open it with your foot, because your arms are full. We found that this handy item takes all those problems away. You can carry more using just one hand than you could with two, leaving you free to open doors. It’s also a much more ergonomically sound way of picking up and carrying logs. 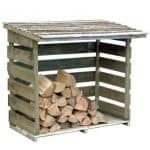 We think that anything that encourages people to use logs as fuel, and therefore reduce their carbon footprint, is a good thing, so this is a must buy for people who are purchasing a shed with a log store.